In conjunction with the 2018 Kuala Lumpur International Motor Show (KLIMS), 3M Malaysia is offering attractive discounts on various packages to ensure both you and your vehicle are protected from the harsh weather conditions in our country. 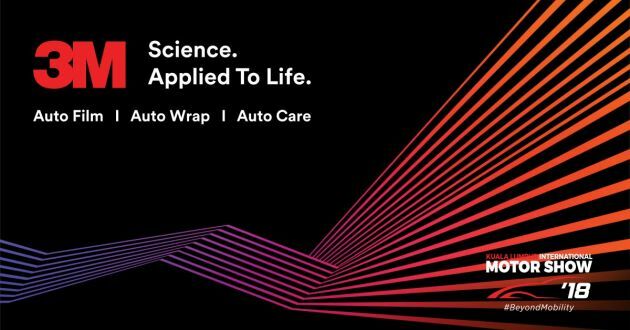 For starters, there are 3M Auto Film Packages applicable to all car types, be it a sedan, SUV, or even an MPV. Prices start from as low as RM2,400, which includes savings of up to 46%, and includes complete coverage for the windshield and windows using either 3M Scotchshield Crystalline security film or standard Crystalline film. Pimp your ride with 3M Auto Wrap Packages that are priced from RM4,999 (savings of up to 32%). There are three different package levels to choose from – Basic, Intermediate and Extreme – all accompanied by free gifts in the form of a set of 3M Nomad Car Mats worth RM300 and 3M Scotchgard Paint Protection Film Pro Series for headlamps worth RM980. Last but not least, residents in the Klang Valley have access to the 3M Scotchgard Pro Series Essential Protection Package, which starts from RM6,400 after savings of up to 34%. Included in the package is complete protection for your car’s bonnet, front headlamps, bumper, front fenders, side mirrors, door steps and door handles, all using high-quality Scotchgard Pro Series Paint Protection Film. These deals are available at participating 3M Malaysia Authorized Installers until December 2, 2018, but if you book a package at KLIMS, specifically 3M Malaysia’s booth 2260 at MITEC, you’ll enjoy more benefits. These include additional freebies as well as a chance to participate in a lucky draw to win a grand prize worth more than RM16,000. You’ll also be able to check out other products from 3M like its Auto Care range plus 3M Auto Detailing packages as well. Interested? Head on over to 3M’s KLIMS microsite to find out more where you can also book the base promotion packages online if you can’t make it to the show.